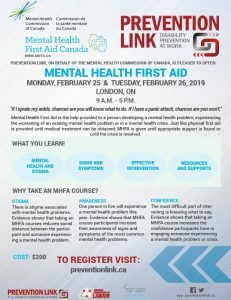 Prevention Link is thrilled to offer this two-day course gives participants the skills to provide assistance to a person developing a mental health problem or experiencing a mental health crisis. Just as physical first aid is administered to an injured person before medical treatment can be offered or until the crisis is resolved. **Participants must be present for the full length of the course in order to be certified.